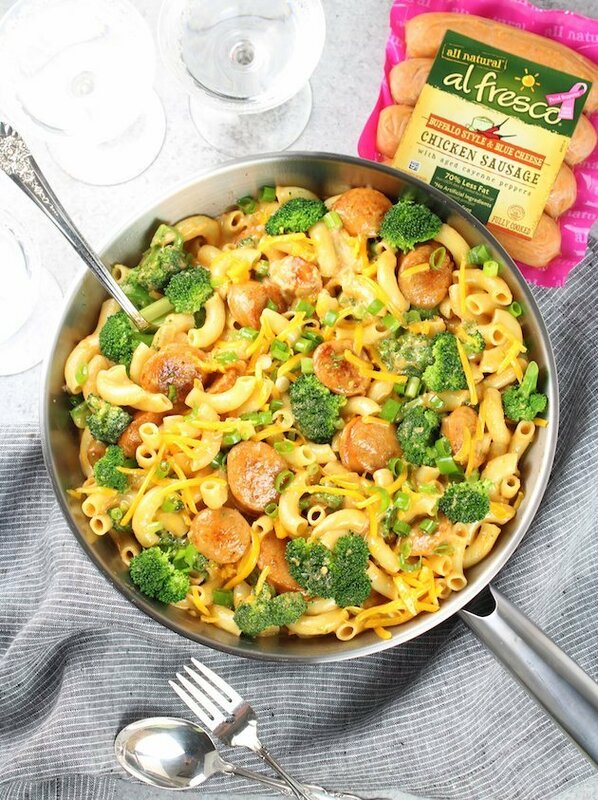 Thanks to our friends at al fresco all natural for sponsoring this Buffalo Chicken Broccoli Mac and Cheese! 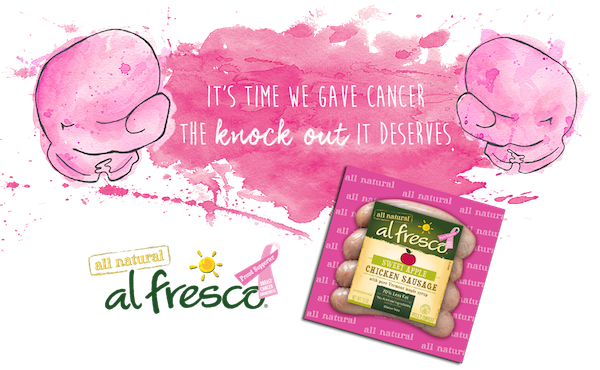 We’re thrilled to partner with al fresco and the Ellie Fund in honor of National Breast Cancer Awareness month. 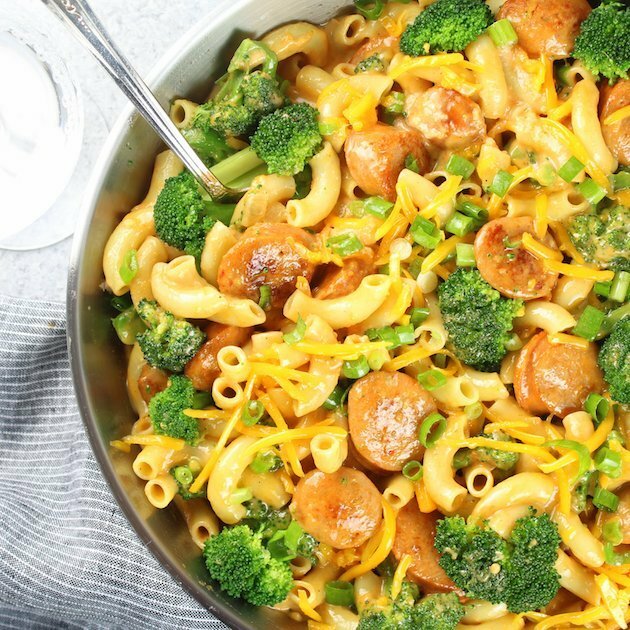 This buffalo mac is a cheesy and comforting meal the whole family will love. 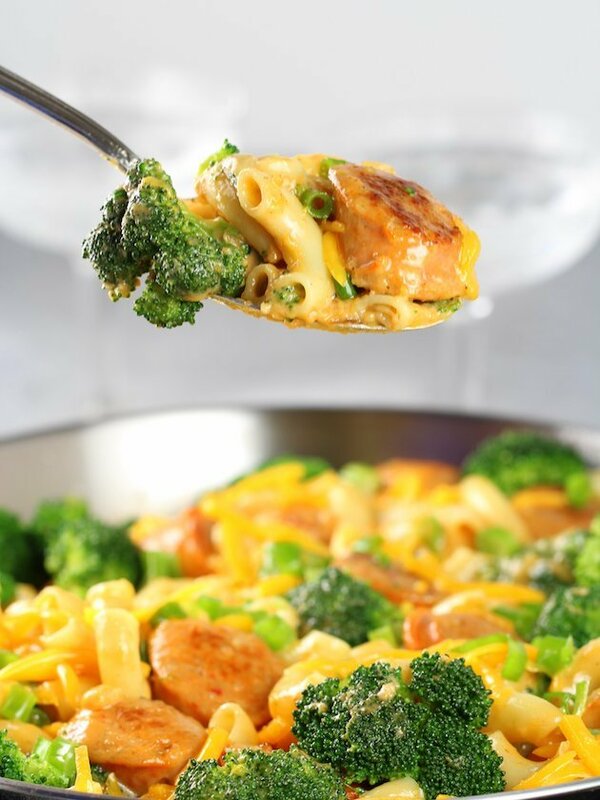 With buffalo chicken sausage, fresh broccoli, and the best cheddar/blue cheese sauce of all time. This one’s a keeper so get ready for a warm cheesy hug! I’m not sure there’s anything more comforting than a big ole’ pot of mac and cheese. My mom had this dish mastered! 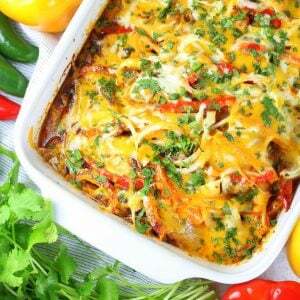 Full of creamy cheese goodness and the noodles cooked to perfection… Mmm, mmm! My momma was a fabulous cook. She could make tuna casserole taste like 5-star dining, but even better because it was full of all her sweet love. Ah, I miss her so much. She’s been gone now for almost 15 years. She was 59 when she was diagnosed with ovarian cancer. It was in a very advanced stage when they found it. I had just finished college and was living in Oklahoma at the time. I remember talking to her in the fall when she mentioned “not feeling right…” She saw a doctor who wasn’t sure what the problem was, but decided to put her on hormones (which unbeknownst to either of them made her cancer grow even faster). By December I was at home for Christmas, sitting in the waiting room while my mom underwent a colonoscopy because they still hadn’t figured out what was going on. That test led them to do exploratory laparoscopic surgery. It was really bad… My poor mama. She was the most family-loving, people-serving, God-honoring woman I have ever met. She was my everything. My best friend, my advisor, my mentor, my prayer warrior, my mama. She went on to have very aggressive surgery (a full hysterectomy, removing tumors throughout her abdomen, and re-sectioning her colon). Within a week they had started chemotherapy and she was one sick lady. 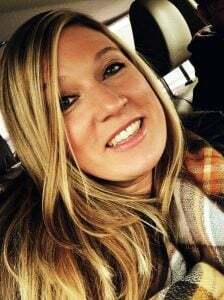 Our family, friends and church rallied around her – meeting whatever need they could… rides to her doctor appointments, visits to keep her spirits up, fixing things around the house, and so many meals. While she was going through chemo and feeling icky, kind people were delivering meals regularly. It was so sweet, but she couldn’t eat much of anything. Her appetite was barely there, and her strength was non-existent. She was losing weight by the day. The food she ate was so important. An appetizing hot meal was literally what sustained her. And what allowed her to gain enough weight to be able to get chemo and keep on fighting. 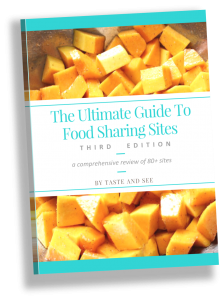 And today many years later, I have the privilege of creating a recipe and sharing it with you, so you can do the same: Help sustain someone with a delicious home-cooked comforting meal for a mom that is fighting for her life, and a family who really needs it. You may have already known that October is National Breast Cancer Awareness Month. 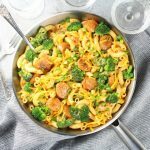 And for today’s post I’m proud to be partnering with one of my favorite brands, al fresco all natural, to bring awareness to this cause and encourage you to bring a meal to a loved one that may need some extra support… this month, and beyond. 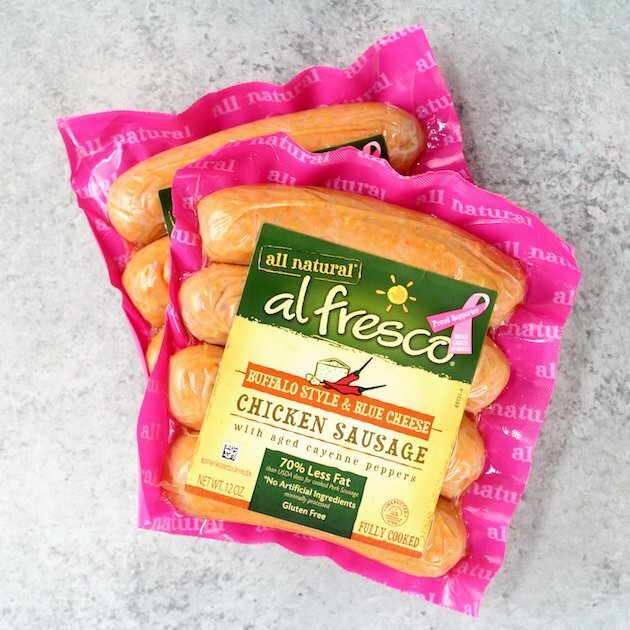 al fresco launched an initiative two years ago in partnership with The Ellie Fund, an organization in Massachusetts that provides essential support services for breast cancer patients and their families. This partnership led to al fresco’s donation of 3,000 healthy meals to women each year! al fresco hopes that by providing simple, nutritious meals, they are alleviating patients of a chore, and allowing them to focus on healing and spending more time with their families. It’s such an incredible concept. Meeting a simple need that means so much and requires so little… some time out of your day and a yummy meal. Sometimes we don’t realize how important it is to give those we care about the gift of being present in the midst of their struggle. I hope I’ve inspired you today to look around and be what someone needs. Nothing grand or elaborate, just a visit to check on them or a yummy meal they didn’t have to make themselves. You’re my crew so I know you’ve got this – right!??? Let me show you the way of the Buffalo Chicken Broccoli Mac and Cheese. 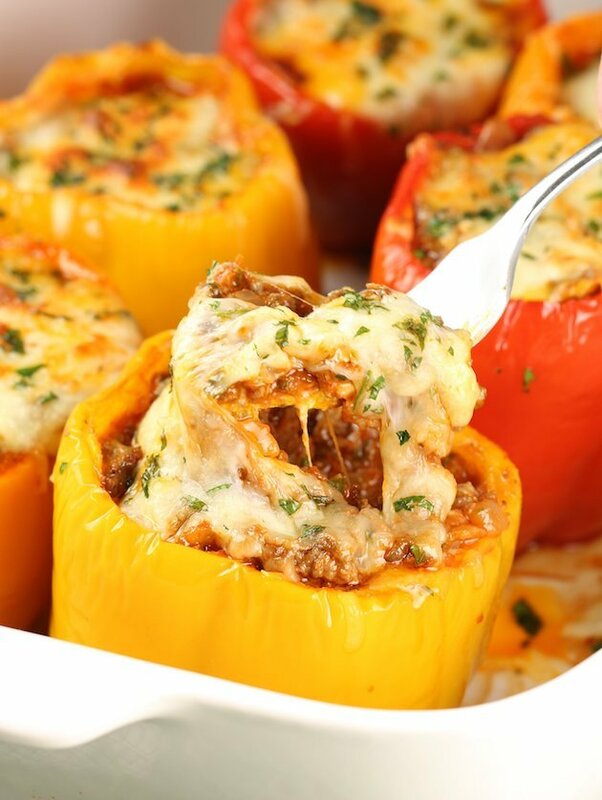 Truly a delicious and comforting meal any family would love. Believe it or not I did extensive research on this recipe. I mean, I did, but it required much more research and deliberation. I will spare you the details but it all has to do with science. Don’t worry “Science 101” is not in session today… but just know in order to prevent your mac and cheese from being gritty it requires more than just cheese, milk and a whisk. Umm, well, unless you’re using American cheese … in which case you’ve found the Lost City of Gold. So this recipe. 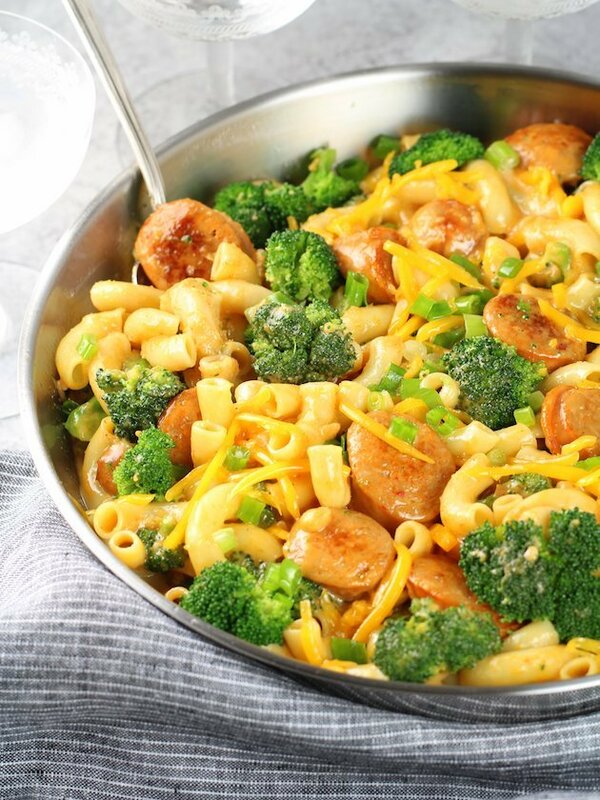 It’s yummy and comforting… literally it’s like a big warm cheesy hug. Exactly what we all want every day, let alone someone going through a difficult time. Let’s start by talking about al fresco’s Buffalo Chicken Sausage. AHHH-MAZING!! Seriously, it is so flavorful. Made with lean chicken, aged red peppers, salt, garlic, and just a tad of crumbled blue cheese… they totally nailed it in the flavor department. So so good. Oh and it’s completely gluten-free. Since the sausage is precooked they are virtually ready to go. I slice them up and sauté for a few minutes a side to heat them through and to add a touch color. Next, let’s move on to the pasta. Really you just follow the package instructions. I used a medium size elbow macaroni and boiled them for 6 minutes. But because I’m all about saving time, for the last 3 minutes I added the fresh broccoli to the pot. Voila! 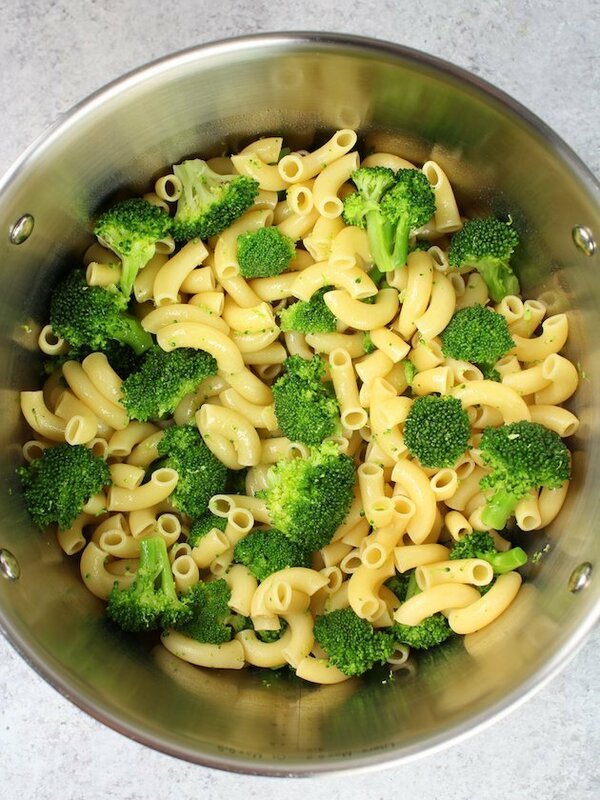 Six minutes of boiling = perfectly al dente pasta and broccoli. Finally, I turned my attention to the cheese sauce. Saute a small chopped onion and some garlic, add in the milk and allow it to heat through. 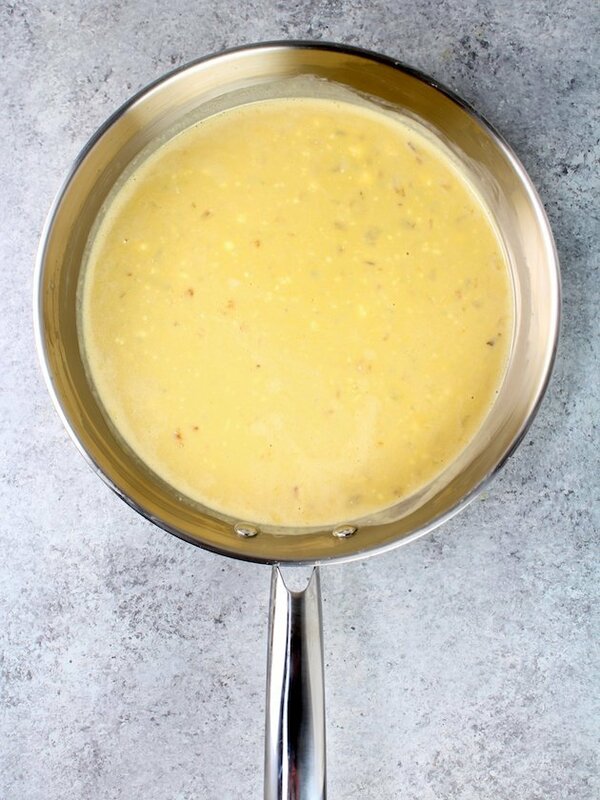 Pour in a little cornstarch/milk mixture for thickening and allow it to cook for about 3 minutes. Then stir in the magic ingredient: American cheese. Plus some blue cheese, ‘cause this is a Buffalo Chicken recipe – hello! 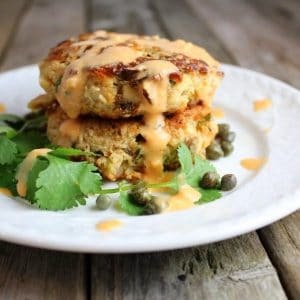 Once it melts remove it from the heat and add the sharp cheddar cheese, put the lid on the pan and let it sit 5 minutes. By then all the cheese should be melted and you can give it a stir. 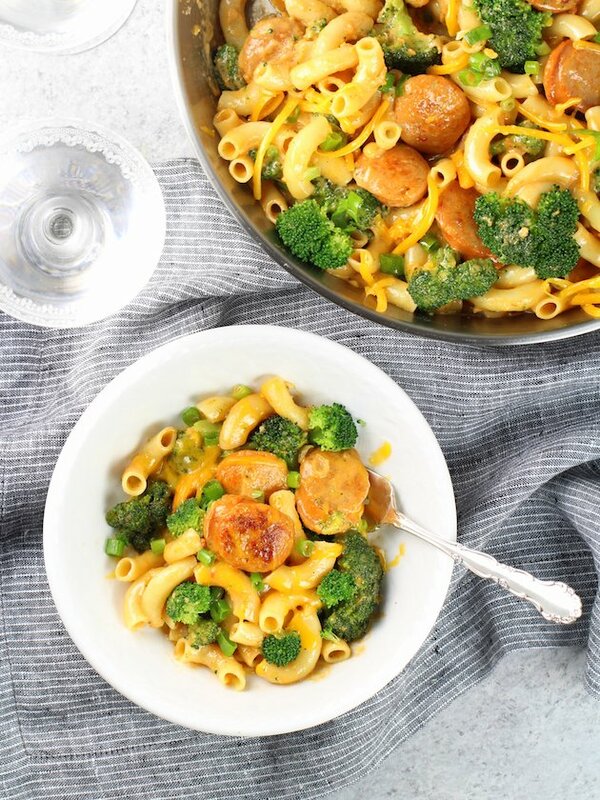 This meal is just perfect: you have your delicious and healthy protein (thank you al fresco), you have your super-food – dun dah daaa… BROCCOLI, you have your stick-to-your-bones-and-fill-you-up pasta, and finally your ooey gooey, super-creamy, and never-gritty cheese sauce!! This is not the opera, so clapping is completely acceptable at this time! I’m so excited for you to make this meal. 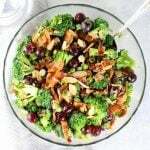 And even more importantly share it with someone who needs to feel the love of a comforting and yummy meal so they can focus on healing and their family. PS: Pro tip – Make a double batch ‘cause this is a meal you’re gonna want to eat yourself! 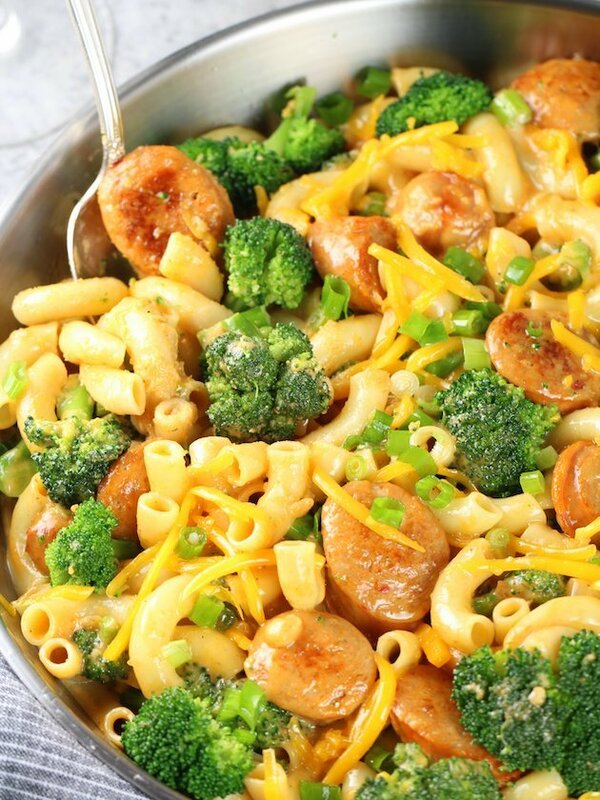 If you enjoy a little heat add 1 tablespoon of hot sauce to the cheese sauce right before you add the pasta, broccoli and chicken sausage. If you want to reheat the dish, cover it with tin foil and bake it at 375F for 20-ish minutes. If blue cheese isn’t your jam, then leave it out of the recipe. No harm no foul. 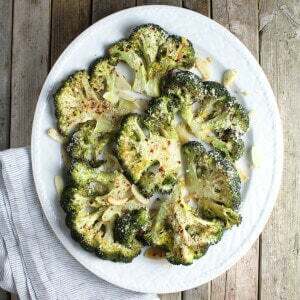 If for some reason you have an allergy or sensitivity to broccoli (that might possibly be me, my sister and my brother) you can swap it out for cauliflower or leave it out all together. 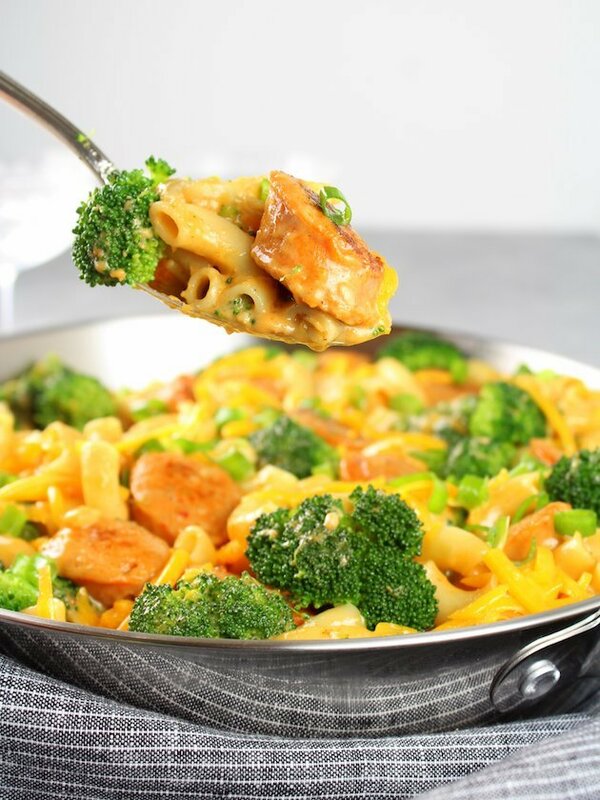 Buffalo Chicken Broccoli Mac and Cheese - a cheesy and comforting meal the whole family will love! Boil pasta in 2.5 quarts of water with 1 tablespoon of salt, as per package instruction for al dente doneness. 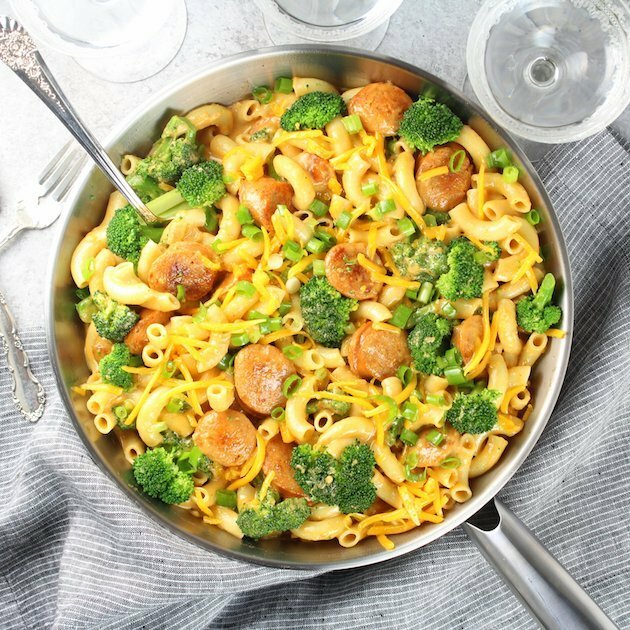 When the pasta is 3 minutes from being done add in the broccoli florets. Strain and set aside. 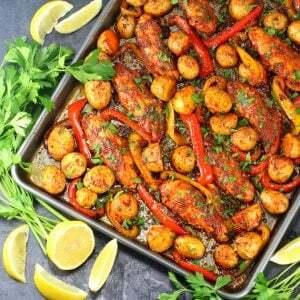 Slice chicken sausage, and saute in a large pan with 1 tablespoon of olive oil for 2 minutes per side. 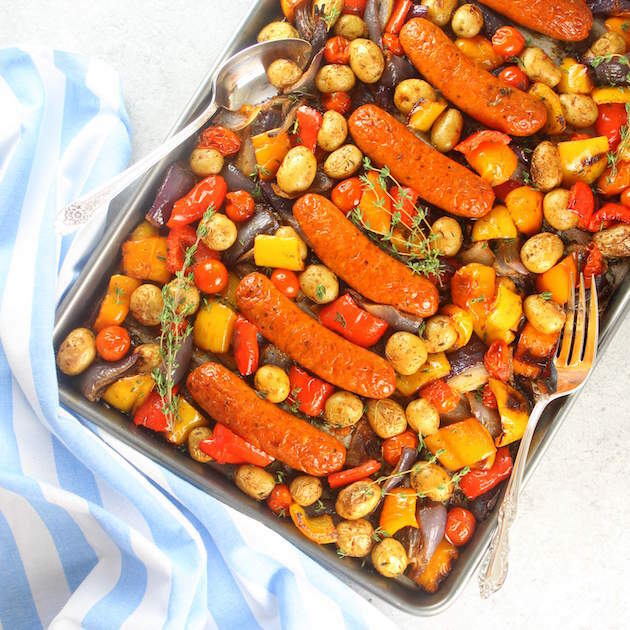 Remove sausage and set aside. 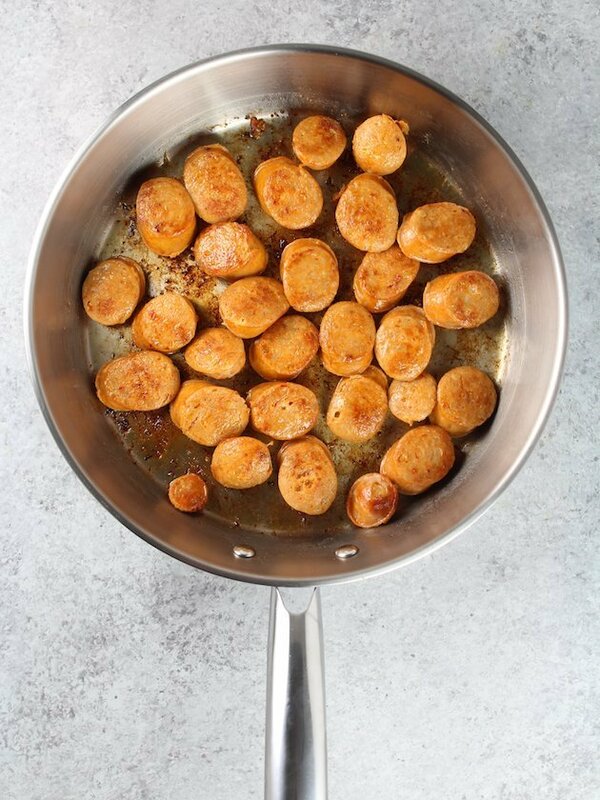 Add another tablespoon of olive oil to the pan, then sauté onions for 3 minutes. Add the garlic and cook 2 more minutes, then add in the milk and stir. Heat milk but don’t allow it to simmer. Add in the American cheese and the blue cheese and whisk. 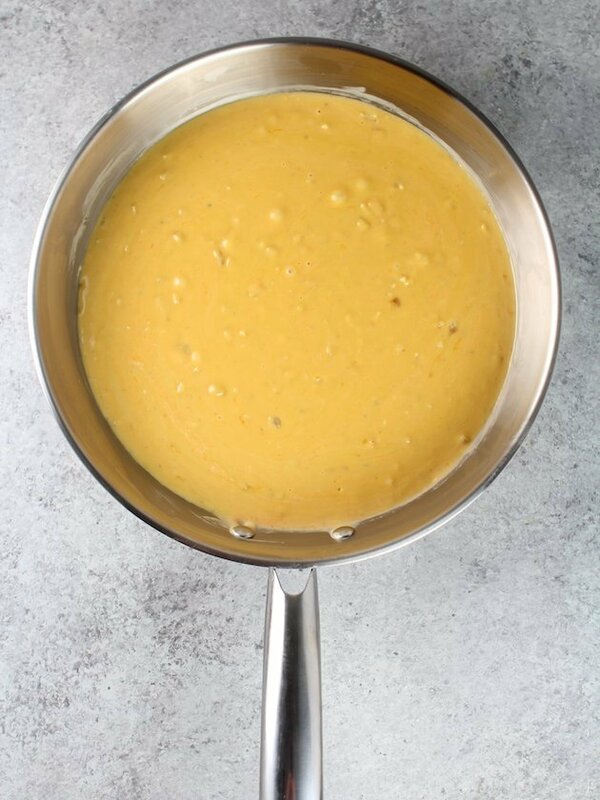 When the cheese is melted, mix 2 teaspoons of cornstarch with ¼ cup of milk and whisk into the mixture. Cook for 3 minutes. Mixture should be thickened. 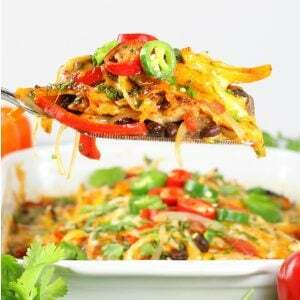 Remove the pan from the heat and sprinkle the cheddar cheese into the pan. Do not stir in, but make sure it gets down into the sauce. Cover and let it sit for 5 minutes. Now stir the cheese in, and add the buffalo sauce if you decide to use it. 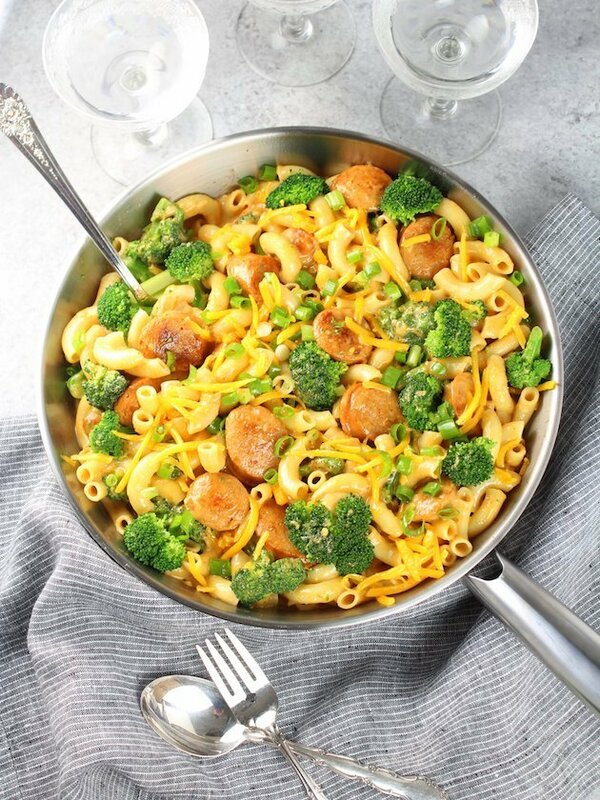 Fold in the macaroni, broccoli and chicken sausage, garnish with green onions and serve. 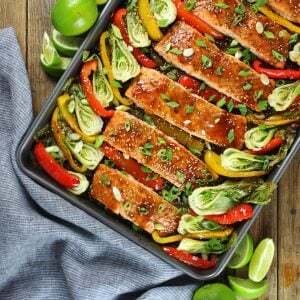 You can also reheat the dish by preheating your oven to 375 degrees, placing the mixture in a 9x13 baking dish, covering with tin foil and baking for 20-30 minutes. 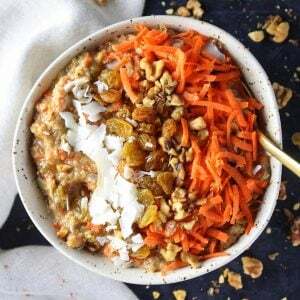 Looking for more easy, healthy, recipes? Thanks so much my friend! It’s super delicious!